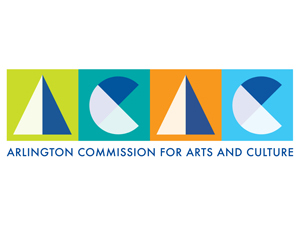 2018 was a huge year for the Arlington Commission for Arts & Culture, and we’re pleased to share some of the highlights and accomplishments in our Annual Report. 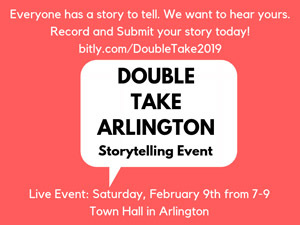 We have created a solid foundation for 2019 to be our most successful year yet in our continued quest to help promote the thriving arts and culture scene in Arlington! “Opened”, a contemporary basketry piece by Sharon Stafford, has won third place in the 2018 Lewton-Brain Foldforming Competition. This award is quite special to Sharon because “Opened” is a wonderful intersection of the two main branches of her art – metalwork and basketry/weaving with metal. The textures and forms of the two work together beautifully in this piece. She’s still thrilled and amazed by the final outcome of this piece. This is Sharon’s second recognition by the Lewton-Brain Foldform competition. 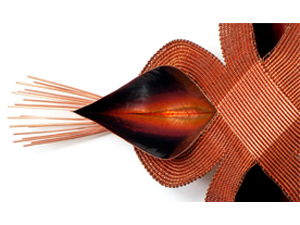 In 2016 she received Juror’s Choice recognition for “Coiled Cup” another piece combining foldforming and basketry techniques. The Lewton-Brain Foldforming Competition, founded in 2012, is a survey of the evolution of foldforming as it is applied in the world today in jewelry, sculpture, architecture, functional objects, and unexpected applications. Judges look for a well-crafted use of foldforming techniques in the metal arts, in a fully realized work, with points for excellence of execution and bold explorations. Complexity carries weight, but so does creativity and fresh expression. Artists are often recognized for simple folds that are deftly repeated, used in mixed media, or combined with other metal techniques. And prize-winners from previous years are asked to introduce substantive change or evolution in their new entries. The four copper pods in the piece were created with the metalsmiting technique – foldforming. 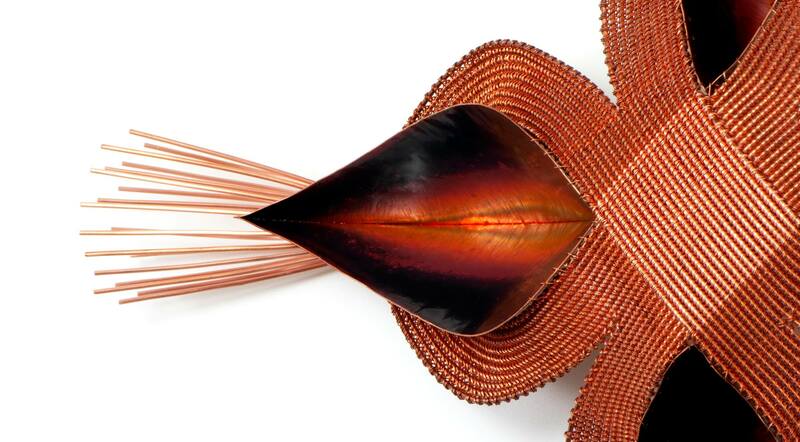 Sharon then wove four copper wire “petals” around them with the traditional basketry technique – twining. The pods were then sewn into the petals with copper wire. Use the exhibit space at the former Arlington Tailoring & Dry Cleaning (888 Mass Ave) to display your work. High School students in Arlington are encouraged to apply. dimensions of the window are the following: 60″ in height, approx. 8.5″ in deep, and about 51″ wide. To submit your proposal, or for more information, contact Ali Carter, Economic Development Coordinator at acarter@town.arlington.ma.us or 781-316-3095. DEADLINE FOR SUBMISSIONS IS JANUARY 25, 2019 AT 5 P.M.
transportation for a more sustainable world. “In the past few years urban wildlife has made a comeback of sorts. It’s been amazing to see bald eagles and coyotes, as well as the ubiquitous bunnies. When I grew up here in Arlington, the only animals I saw were squirrels and opossum,” de Rosas explained. 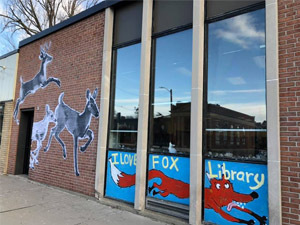 “Since the mural is on the Fox Library, there needed to be foxes,” she continued. Her next words reveal the deep kinship she perceives between animals and people. She could be describing any of the human families who find a second home in the welcoming spaces of this beloved branch library: “The vixen is smiling at the two kits who are running to greet her, and at the bottom of the wall, is a resting fox face. He is happy because he took the bus and now he can rest and sleep!” This is a perfect ending to the story of our BRT Public Art Project, since investing in public transport will ultimately shape a more sustainable, safe and peaceful world for all of the planet’s inhabitants. Many thanks to the staff and Trustees of the Library for their generous support of La Passeggiata. 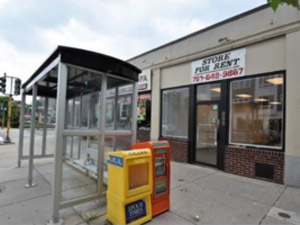 This project, along with public art in and around five bus shelters and a mural on Za Restaurant, was made possible with a grant from the Marion Institute and Barr Foundation and organized in collaboration with the Arlington Department of Planning and Community Development. This year’s Youth Banner Initiative winners have been selected from 95 submissions. Judging took place in mid-December with three panelists including Selectman John Hurd, Arlington artist Kate Holcomb Hale, and artist and chair of Arlington Public Art, Adria Arch. 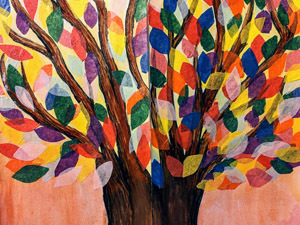 The group chose the selected artwork based on adherence to this year’s theme of trees, artistic quality, creativity, and readability from a distance. A reception to showcase all submitted art will be held in April during Arlington High School’s annual art exhibition. Arlington Public Art’s Youth Banner Initiative aims to promote and encourage development in the visual arts and to provide an opportunity for youth to participate in temporary public art projects in Arlington. The initiative is geared to young people in grades 6 through 12 (and the equivalent homeschool level). Funding is provided by the Gracie James Foundation in memory of Gracie James, who was a beloved, artistically talented Arlington High School student. The program invites teens to submit designs relating to a specific theme to be digitally reproduced on vinyl banners which are then hung on light poles along Massachusetts Avenue in Arlington Center. The following is a list of the students whose work was selected for the 2019 Youth Banner Initiative. View their artwork here.